Jimmy Cricket has been interviewed on BBC Radio Lancashire about the staging of his first play later this month. 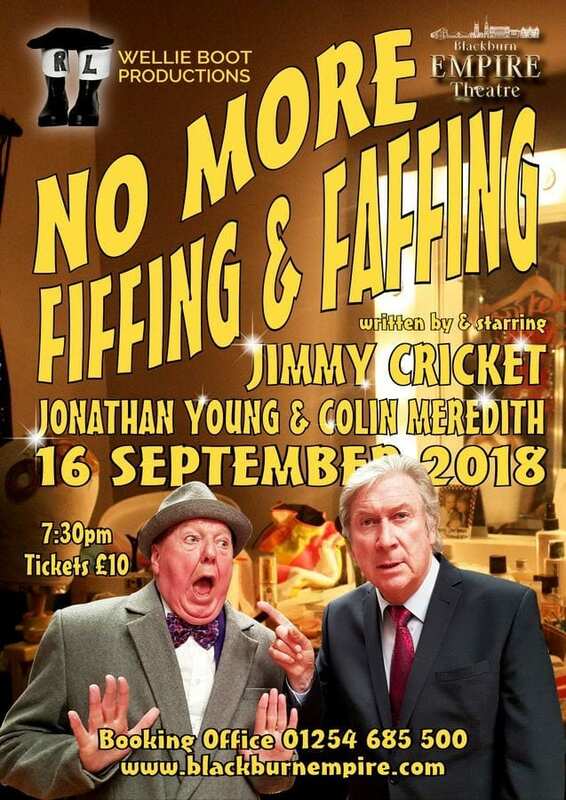 The famous comedian was accompanied by fellow actor Colin Meredith to talk about No more Fiffing and Faffing, which will be performed at the Blackburn Empire Theatre on Sunday 16 September at 7.30pm. Appearing with Jimmy and Colin, who has had several notable appearances in ITV’s Coronation Street over the years, will be Jonathan Young from The Bachelors. Tickets cost £10. You can also book by telephoning 01254 685 500. The theatre’s email address is boxoffice@blackburnempire.com. 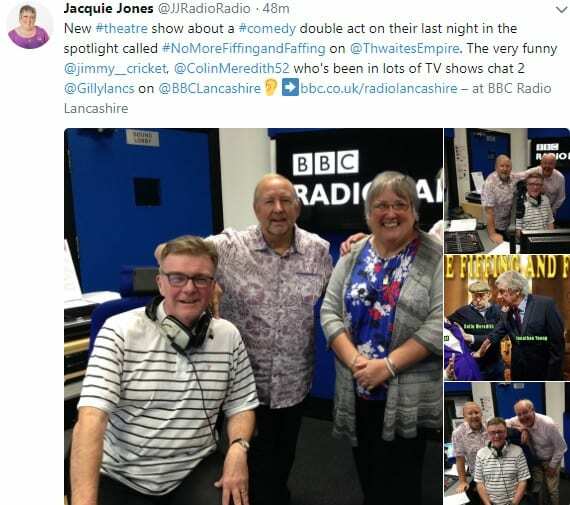 Jimmy Cricket is stepping up the promotion of his new charity Christmas CD through appearances on several popular radio shows during November. Santa bring my wellies back to me has been released for the Christmas 2016 season, with all proceeds being donated to the Francis House Children’s Hospice in Manchester. The Bob Mills show, which TalkRADIO broadcasts on Sunday evenings, is down for famous entertainer Jimmy, 71, to appear on during mid-November. He will also be heard over the airwaves at a string of local BBC radio stations, including with presenters: Debbie McGee on BBC Radio Berkshire; John Gilmore on BBC Radio Lancashire; Wynne Evans on BBC Radio Wales; and James Watt on BBC Radio Stoke. He will also be the subject of a Desert Island Discs feature, which Bob Fischer presents on BBC Radio Tees. 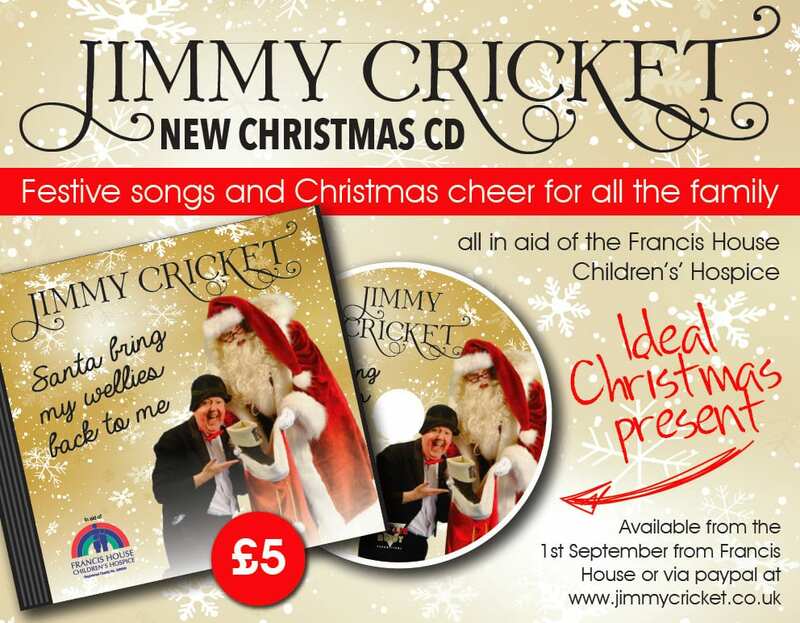 Jimmy’s new charity Christmas CD is available to buy from this website through a PayPal facility or in person directly from the hospice.